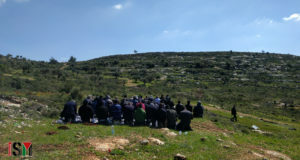 During the early morning hours of June 26, the Israeli army invaded the village of Awarta, 8 km south of Nablus in the northern part of the West Bank. According to witnesses, between 150 and 200 soldiers entered Awarta just after midnight and raided approximately 300 houses before leaving several hours later. Some residents mentioned that the soldiers knocked on their doors and asked for identification, however this was not the case for Mahmud Awad, a local schoolteacher, and his family. At midnight approximately 15 soldiers entered Awad’s home and demanded that Awad show them the location of his guns. Were he not to obey, he could be confident that the house would be destroyed. Awad replied that Israeli soldiers had already been to his house many times and had never found anything. He had no guns, he assured them. The soldiers blindfolded and handcuffed Awad’s 20-year-old son and took him outside for an interrogation that lasted three hours. They herded the rest of the family, which included an eight-month old baby and several other children, into the living room. Again they asked Awad about his guns. “Watch what we will do if you don’t give them to us!” An Israeli soldier yelled. The children listened in terror as the soldiers proceeded to ransack the house. 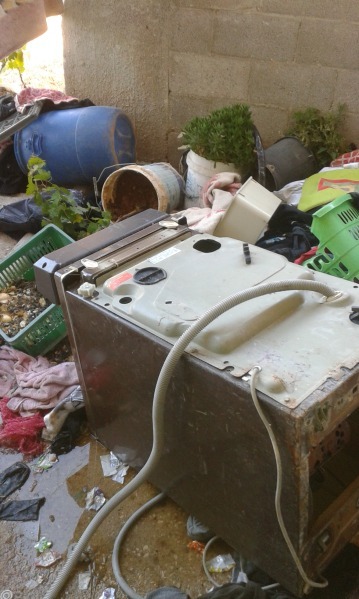 They ripped apart sofas and chairs, threw the contents of shelves on the floor, knocked over electrical appliances, destroyed two computers, and slashed the family’s water tank on the roof. Awad begged the soldiers to allow the baby a drink, but this request was denied. Sometime during the night, Awad’s 13-year-old son was taken outside the living room and interrogated for half an hour. A soldier held his rifle to the boy’s face and demanded the location of the guns. He held a piece of cloth (chloroform, a family member assumed) to the boy’s mouth until he became dizzy. The soldiers finished searching the house, having found no weapons. They released both of Awad’s sons and left the house at approximately 4 a.m.